I colour treated my hair six times last year and ended up with damaged, frizzy hair, so this year my goal is to bring back some strength and shine to my hair. I was introduced to Hair Recipes earlier this year and I have to say – you need this! Hair Recipes is a haircare brand that harnesses the power of ingredients found right in your kitchen to help improve the texture of your hair. 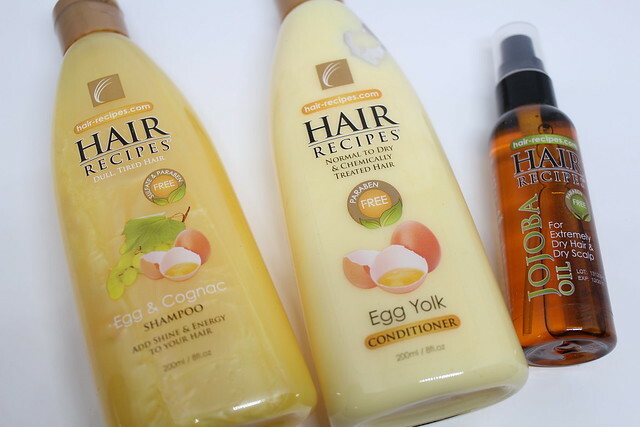 In the products, you’ll get the benefits of Egg, Beer, Wheat Germ, Lemon & Chamomile found in the Hair Recipes shampoos, combined with the Egg Yolk conditioner to create beautiful, strong hair. I received a set of products for dry, dull, tired hair, and it was exactly what my hair needed. 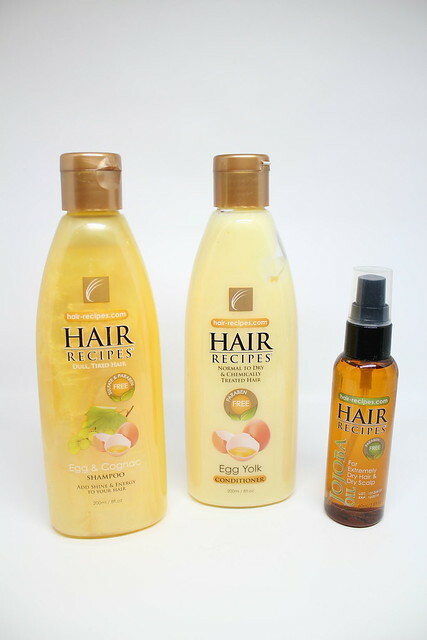 This bundle contains the Egg & Cognac Shampoo, the Egg Yolk Conditioner, and a bottle of Jojoba Oil for hair and scalp. The Egg & Cognac Shampoo is a thick shampoo that lathers very thickly, cleans extremely well, all without stripping. A little bit goes a long way, and even though I wash my hair once every 4-ish days now, I find that it still has enough power to wash off all the grime, grease, and my dry scalp flakes out of my hair. It never feels too harsh though, which is good because I don’t want a clarifying shampoo to damage my hair even more. The Egg Yolk Conditioner is a thick, creamy conditioner that coats my hair really well and leaves it feeling ultra nourished. I am completely addicted to this product because it replenishes all the lost moisture from my hair, without weighing it down. My hair just ends up feeling stronger, like you know in those hair commercials where they swish the head around and the hair looks so sleek – that’s how I think my hair looks! My usual hair routine before trying Hair Recipes has been shampoo, conditioner, and apply some kind of hair serum or oil, but with the Egg & Cognac Shampoo + Egg Yolk Conditioner combo, my hair has been so shiny, and healthy, even without the use of any hair serums or oils. The jojoba oil I received in my package is great for dry hair and replenishing dry scalp as well. I haven’t use this on my scalp, just because I don’t want my hair to turn into a greasy mess, and a little goes a very long way on the ends of my hair. Even then, I rarely use this because the shampoo and conditioner alone are enough. Just so you don’t think I’m full of raves for haircare products – right before I received this bundle from Hair Recipes, I was using another salon professional haircare brand I received and I absolutely despised it. It was designed for coloured and damaged hair, but it was so lightweight that I felt like I didn’t apply any conditioner, and the shampoo was also such a lightweight that it didn’t clean my hair properly… I only used that set of products maybe 3-4 time before switching to Hair Recipes and I won’t be looking back at all. You can purchase Hair Recipes products online. That jojoba oil sounds very interesting! I’m still on the lookout for a good scalp oil. Do you find that your scalp gets greasy quickly if you use a scalp oil, regardless of how well you wash it off?